I’ve owned Cthulhumas.com for some time, but wasn’t quite sure what to do with it. 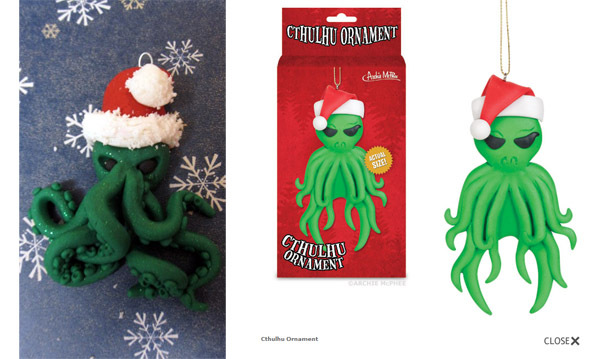 Now, I’ve figured it out, but it’s too darn late (this year) to get the site up and running in addition to everything else I’m doing: I’m making Cthulhumas tree ornaments, picture frames, tealight holders, devotional candles, and tentacle stockings to hang by the fireplace. If things go well, next year I’d like to branch into card-printing. I set up shop at Etsy for the ornaments while I’m finalizing details on the rest of everything (which should be posted for sale in the next couple of days), and in 2 days, I’ve already been featured on WonderLand! Um, if I want ornaments, do you think I can get them by Christmas? Because, seriously, that is one of my Christmas presents done right there. Also, I don’t know how hard it’d be to do, but you know what would rock? 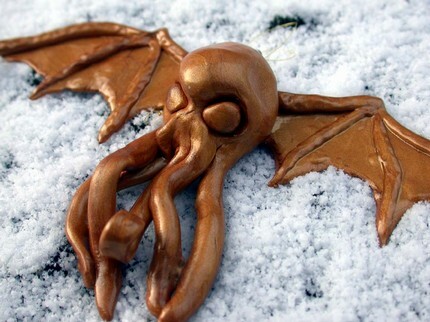 Cthulhu cookie cutters. hmmm. That’s a rocking idea! Do you do other colors? If so, I think I want two purples that look like the green one linked here. I’ll probably want more later, but let’s just stick to that for now. Should I order them off your site on etsy so you can get the ratings/feedback? These are awesome! ^_^ The Santa hat one is so wrong in a good way. Hey, if you can make them strong enough you should totally make tentacle wall hooks for hanging stockings and such. Was just thinking of the bloody finger hooks they have at Archie McPhees. 😀 Must be that time of year because last night I made a Cthulhu paper bank pattern! That’s a really good idea! The tentacle ornament I made is actually quite strong–it’s only when the pieces are thin that they’re delicate. I want to see your Cthulhu paper bank pattern! Thanks! Obviously the whole thing is a winning idea. And let me check on the orders and get back to you in a bit. Isn’t that what Cephalopodmas is for? Aaah, I’d never seen that before! 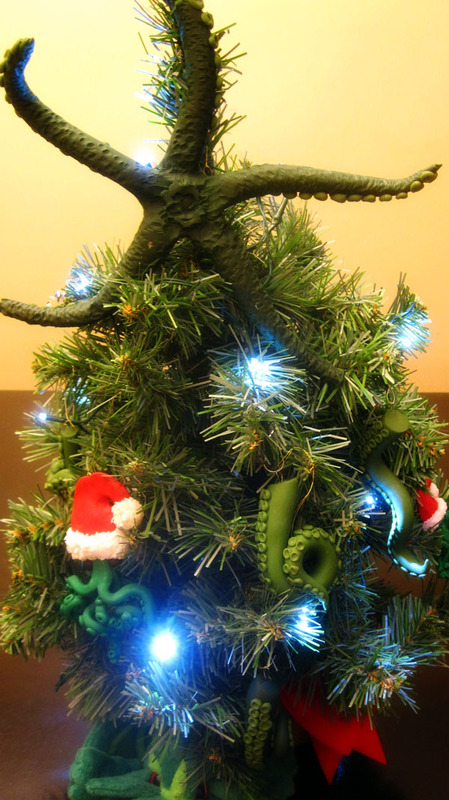 I will happily celebrate Cephalopodmas, but also feel that Cthulhu deserves a day of his own, not lumped in with mere octopuses. Can you believe I only just started reading my first Lovecraft ever? And it’s so old the price on the cover is $2.50. It’s actually old enough that it’s public domain! I hope you like it–I know that the language is a huge turn-off for some. Yeah, it’s not easy reading. I’ll read a paragraph and not remember wtf it said. Also, so far Cthulu’s only been mentioned ONCE in 200 pages. Lovecraft wrote a lot of stories that don’t include the Cthulhu Mythos or refer to it fleetingly. If you’re interested in Cthulhu specifically, it’s best to keep your eyes peeled for this book on the cheap as it gathers them into one volume instead of being spread out across many different books. The story that really got me into the old ones/mythos was At the Mountains of Madness(spoilers). I’m reading The Dreamquest of Unknown Kadath. It’s kind of funny to look back and see what people ignorant of the cosmos come up with. Cuz I don’t think the concept of *galaxies* had been discovered when he wrote this. Hmm. Your ideas are intriguing to me and I wish to subscribe to your newsletter. Thanks for the link–I plan on making a lightbox within the next couple of days for future photography–stuff like the picure frame is hard to photograph nicely without seeing bits of my crapass apartment in the background. I’d taken pictures of everything on a big pile of ice in my sink on Friday night, but when I woke up on Saturday to snow on the ground, I couldn’t resist using that instead–snow is like nature’s lightbox. Pretty sweet. Nice work there, M! 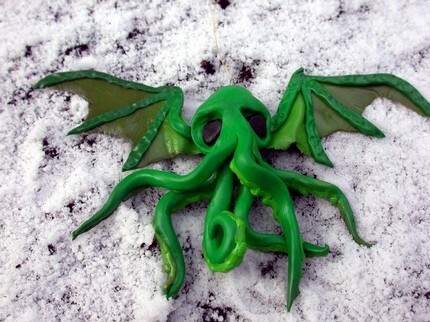 Will you be making something for those of us who celebrate Cthulhukah instead of Cthulhumas? I could probably do some tentacle star of davids! Or a tentacle menorah! Do it! I will give you all me monies.